Need more information about booking Home 129307 ? This luxury one-bed apartment is on the second floor of a small block of four holiday flats and is our most popular apartment. Newly refurbished in modern neutral colours, there is one double bedroom and one bright spacious kitchen/lounge. The lounge area contains a plasma TV and a 2-seater sofa-bed suitable for two adults. The apartment has one bathroom with a shower cubical, hand basin and WC. Sleeps: Up to 5, 1 double bed, 1 sofa bed and optional fold-out bed (£40 per stay). Further details:There is an English speaking representative close by to answer any questions you might have about the property during your stay. There is an English speaking representative closeby to answer any questions you might have with the property during your stay. This building is located a few steps from the Piazza on King Street. It contains four recently refurbished bright and spacious one-bedroom flats on the 1st, 2nd, 3rd and 4th floors overlooking King Street to the front and the pretty St Pauls Churchyard to the rear. It lies equidistant from Covent Garden and Leicester Square Underground Stations. Each apartment can sleep up to five people – two in the bedroom and two on a comfortable sofa-bed in the lounge area. These areas also contain a table, four chairs and a flat-screen TV. A fifth person can stay in apartments one and two with an optional fold out bed (£40 per stay). There is a maid service (Mon-Friday) excluding weekends and bank holidays. This Apartment has 1 bedroom, 1 bathroom and sleeps 5. It’s been listed on Holiday Lettings since 14 May 2010. Located in England, it has 34 reviews with an overall rating of 4.5. The average weekly rate varies from £1736 to £1851. Response from the manager Thank you for your review and sorry to hear of your difficulties, however all this could have been avoided if you had just asked for an early check-in, then the key safe code would have worked. During your stay we provided you with documentary evidence which showed that you only ever asked for a late check-out but you never got back to us. Such a shame to have put your family through all this and unfortunate that you chose to write the review immediately, rather than wait and learn that we were actually not to blame. We hope the late check-out helped which we provided free of charge. We enjoyed our stay at this flat. It provided everything we needed for a 3 day stay. Close to tube stop and shopping/food everywhere around. Easy walk to the British Museum and Theaters. Covent Garden outdoor entertainment a little loud on Saturday night so we joined everyone at the party and had a great time. Would stay here if we visit London again. Note: Some stairs to climb with luggage. The location is so central and easy to access public transport, but we walked everywhere. Best of all is that it so accessible to theatres.the apartment is bright and modern and has interesting views to the King st from the living room and to the courtyard garden of the st Paul's Covent Garden church. The bedroom is spacious and comfortable , the kitchen compact but adequate for preparing holiday meals.we have stayed here numerous times, mainly because of convenient location, kitchen facilities, and pleasant environment.. The servicing staff are always very hospitable and helpful - a nice bonus for an apartment. My family of 5 stayed here for 4 nights. Plenty of room for 2 adults and 3 teenagers. Wished there were more bedding. But overall great place. My kids loved the heated towel rack. Very efficient washer/dryer. Fabulous location. Right in the middle of the holiday festivities of Covent Garden. Plenty of eating places nearby. Tescos (groceries) at the end of the street. Great entry system. Clear check in instructions. The Covent Garden station is less than 5 mins away. It looks like it will be closed for 2015 though. I stayed here with my teenage daughter last week. Excellent location right in the heart of Covent Garden Christmas festivities. The flat had all the amenities we needed and we were very comfortable. The flat is ideal for two people. The lounge in the living room can be made into a bed, but we found the bedding did not fit, so opted to share the double bed. Even though on lively King St, the flat was surprisingly quiet. Have stayed in various other hotels and apartments in London, but this is now our favourite. I am so happy I spent the time to research a lot of London apartments before settling on this one. 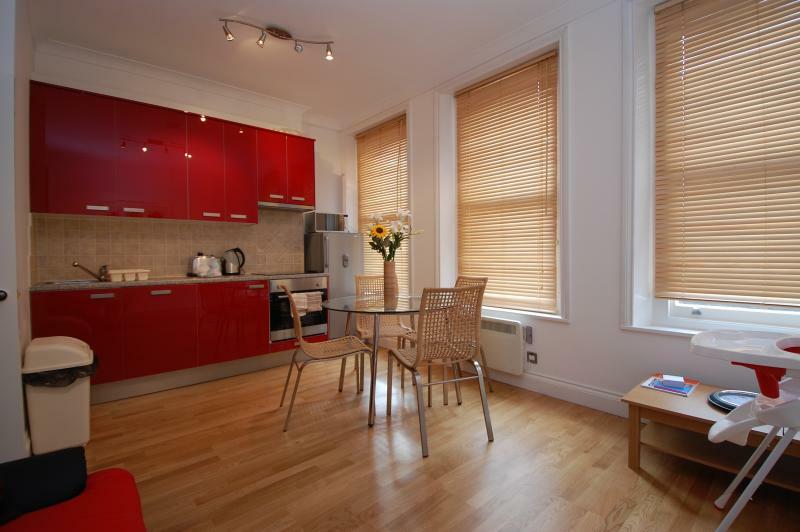 This apartment is a q bed 1 bath apartment located right in Covent Garden. This location in Central London can't be beat. One end of the street is Covent Garden. The other end of the street is a Tesco grocery store. We stayed three days and even with a 2yr old walked everywhere including Borough Market/Tate Modern, St. James Park and Bond Street shopping. The amenities of the apartment were all you could ask for with a fridge, stove top, electric kettle and washing machine. They provided an infant cot for an additional charge and a high chair for free. I would absolutely stay again though I think the bed in this apartment might need a refreshing soon. It's a bit soft. Also, all my inquiries were resolved to my satisfaction but not all my inquires were answered directly. I asked to enter the apartment before the 3pm check in time. While they never said yes or no, when I arrived the entry instructions worked and the apartment had already been prepared. On our first night, there was no wi-fi but I sent them a text and the next morning it worked--though no one responded to me directly. About a week after we left, the deposit was returned. Flat location cannot be beat. One hundred feet from Covent Garden. Bedroom is on back (overlooking a church yard!!) so no problem with noise at night. Facilities are all you need. Service is efficient. Only problem is that you need to climb two flight of stairs. Might be a problem for some. Management company is accessible and responsive. After weeks of searching, my mother in law and I came across this listing. The price was reasonable and the location seemed right. We have just returned and I have to say this place was fantastic. The location was perfect. We felt like we were central to everything and right in the middle of the action. Being right around the marketplace was very nice, as it made finding places to eat very easy. The apartment was clean and comfortable for three people. When I plan my next trip to London, this is absolutely where I will stay. Flat 1 Opera House is excellent. We are UK born but resident for decades in the USA. Cannot beat the location a few yards from Covent Garden. Supermarkets within 100 yards. Bedroom is at the back overlooking a church garden which is locked up at night. So NO noise at all. Good basic furniture and everything you need to cook simple meals. If you are from abroad try buying ready prepared meals at Marks and Spencers (by the Covent Garden Tube Station) and cook them up yourself. Save a ton of money. When leaving to go to Heathrow go to the Covent Garden tube station. Direct elevator to the platform. No steps to worry about. Only problem -- flat does have two flights of stairs to get there!!! And would probably would be crowded if more than two people.